It’s time again for the recipe swaps!! This time around it’s ‘Blogger’s Choice’ meaning you’re assigned a blog and choose a recipe that sounds great to you. I was given Kate’s blog and found quite a few that I’d like to make but ultimately picked this one. 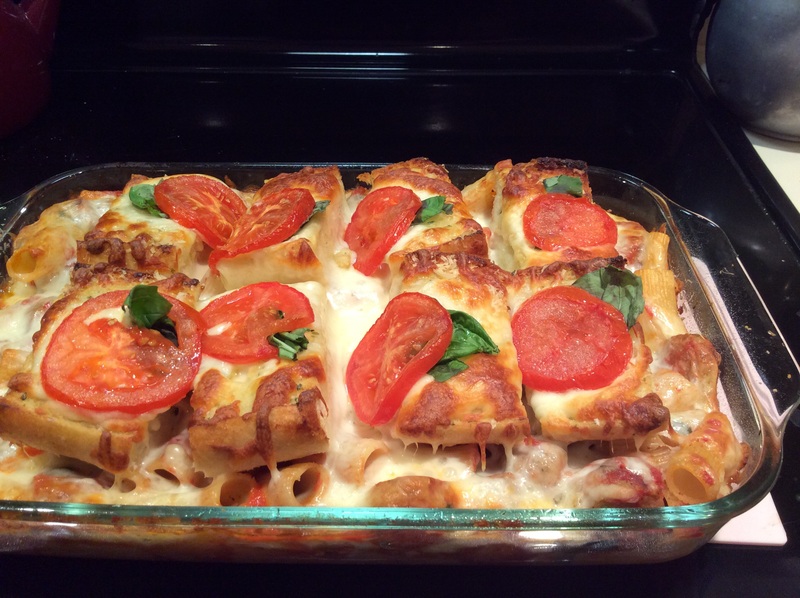 It sounded great for fall, easy to make and nice for a weekend dinner in. It was a huge hit with everyone who tasted it. 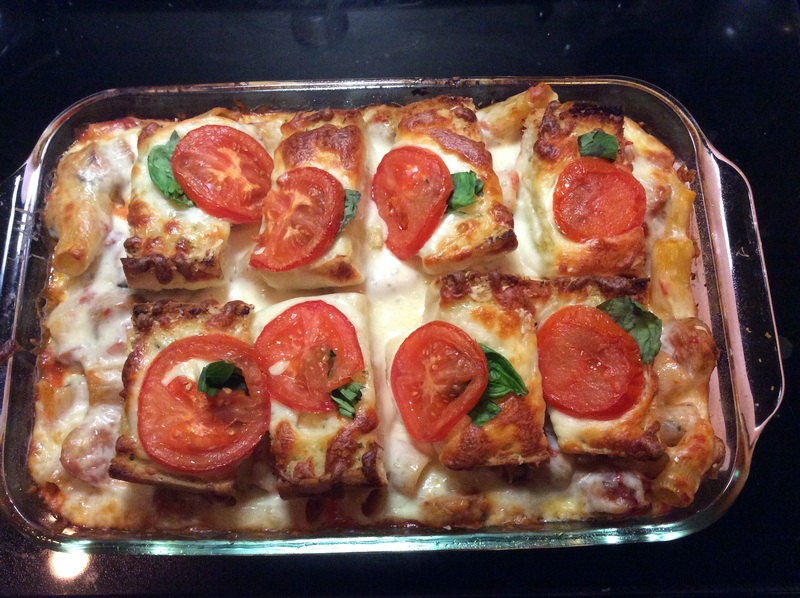 I lightened up the recipe a bit by using chicken sausage and part skim mozzarella. I don’t know who thought to put the garlic bread on top of the pasta under the cheese but I’d like to meet them and give them a hug. What a SUPER idea!! 2 Roma tomatoes, cut into 8 even slices. Cook the sausage and slice into thin coins. Set aside. Heat a large sauce pan over medium-high heat. Add the 1 tsp olive oil. When hot add the onion and cook for a few minutes to soften. Add the garlic and cook for another minute. Reduce heat to low and add the marinara sauce. Let it heat, stirring occasionally, for a few minutes to incorporate the flavors. In a large mixing bowl combine the cooked sausage, cooked pasta, sauce, 1 tbsp basil, pepper and the 1/2 cup Parmesan. Stir it gently to evenly coat everything. Gently pour the mixture into the prepared dish. Make 6 even slices through the garlic bread (resulting in 12 halves top/bottom slices). Using the non-ends line 4 pieces over one half of the pasta and the other 4 pieces over the other half to have 2 rows. Sprinkle the remaining 3 tbsp of Parmesan over the bread. Sprinkle the mozzarella evenly over the bread and exposed areas of pasta. Place the 4 tbsp of olive oil in a shallow dish. Gently dip each tomato slice in and coat it with the oil. Shake off the excess and place one tomato slice on top of each piece of bread. Bake, uncovered, for about 15-25 minutes until cheese is melty and bubbly. It only took about 15 minutes for me. Remove the pan and gently tip up one of the tomato slices and slide one of the remaining full basil leaves underneath it. Repeat with each tomato. Allow the dish to set for about 10 minutes. Note: I sprinkled some more grated Parmesan on the 4 end pieces of the bread, wrapped them in foil and heated them in the oven with the pasta. Um…could you bring some of this to my house for dinner? Puh-lease?!!? Sounds amazing! You are totally right- garlic bread on is genius. This sounds amazing. I had you in the swap and loved the chicken curry soup! Yes, I am also going to need to hug the person that thought of that garlic bread genius-ness! This looks so amazing!